LG is saving its best mobile announcements for the MWC expo next month, it seems, as the company just rehashed the virtues of the Optimus G and Nexus 4 smartphones, and stressed more on its new TVs and connected home business during the CES presentation this morning. During the very same mention of these Ultra HD TV sets, it boasted a feature that probably only Samsung will be able to replicate - streaming games from your LG Android phone to the high-res TVs, upscaled to the mindboggling resolution, and adding 3D conversion for a good measure. 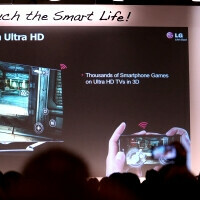 Ultra HD is marketing speak for the 4K/8K resolutions in the next TV sets we are likely to be drooling after this year, so LG said its 2013 Androids will be able to take the gaming experience from the smallish phone screen to the largest screen in the house wirelessly, and at "Ultra HD" resolutions at that. How exactly will the conversion to 3D elements occur, frames and other pressing questions LG didn't specify, but the demo was given with an Optimus G, so current streaming tech like Miracast will be used. Given that the quantity of titles made to fill "4K" resolution of 3840×2160 pixels is likely in the single digits of lab test scenarios, we expect upscaling comes with the territory if you buy one such TV set, so LG's Android phones will take advantage, and add another differentiating factor to the maker's portfolio. If you are ready to shell out five digits on an Ultra HD TV, that is. 3D is pretty neat especially for gaming, but 2D to 3D conversion is TERRIBLE. To get the full effect the game/movie has to be done in 3D otherwise it's not really worth watching the converted image. However, this is new tech so maybe they have solved that shortcoming.